The Seawolves’ Brock Staller falls on his kick for a try, worth five points against Glendale. Brock Staller of the Seawolves scored 15 of the pro rugby team’s points in a 20-18 win over the Glendale (Colo.) Raptors, a rematch of Major League Rugby’s championship game last season. The Seawolves owe their first win of the season to Brock Staller’s foot. 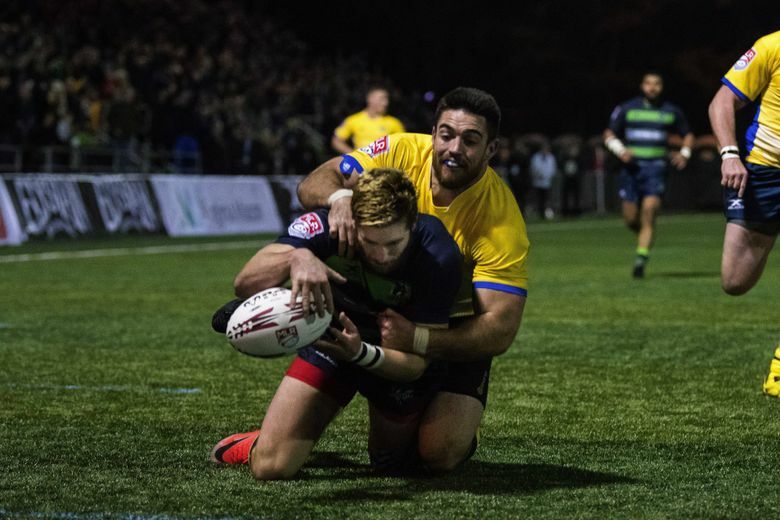 He scored 15 of the Seattle pro rugby team’s points in a 20-18 win over the Glendale (Colo.) Raptors, a rematch of Major League Rugby’s championship game last season. Staller kicked two penalties (each worth three) and two conversions (each worth two) for 10 points. He scored a try that came off his own bouncing kick that he followed into the try zone and dropped on for five more points. Just before putting the ball in for the try, he was fed a pass from Vili Toluta’u, a forward who found his way into Seattle’s back line several times to set up other runners. Toluta’u picked up right where he left off last year in the MLR championship game when he was named MVP. He led the “Seawall” defense, making tackles before the Raptors could reach their own gain line. One of those tackles behind the Raptors’ throw-in from the sideline got the Seawolves backs running toward the Raptors’ goal line where several loose scrums won by the Seawolves led to a try by prop Tim Metcher. That put the Seawolves ahead 10-6 at half. Raptor Will Magie had kicked two penalties and Staller had racked up his first one 20 minutes into the first half. The Raptors opened the second half with two tries in the first two minutes. Dylan Taikato-Simpson took a pass out of a loose scrum and scored five in the corner. Magie converted to bring the score to 13-10 for the Raptors. Next play saw the Raptors charging down the field again with John Ryberg running through the Seawall for a score in the other corner. Magie took the kick straight out from where the try was scored and couldn’t make this one connect. With 65 minutes into the 80-minute game, Staller scored his try. “I saw space to go and I went ahead,” Staller said. His conversion got the Seawolves within one point, 18-17. With five minutes left in the game, the Raptors wheeled the scrum around to an offside position, giving Staller the penalty that gave them the two-point win. Magie tried a penalty kick from the 50-yard line at 76 minutes, but it fell short. “We were hesitant sometimes and need to set up to get the ball where we want it to be. We also need to work on drop tackle instead of high tackles that drag them past the gain line,” he said. Olive Kilifi, a prop who has played for the U.S. national team, agreed.